When Marquise Cormier was in first grade, the public school system recommended that he be placed in a special education class. 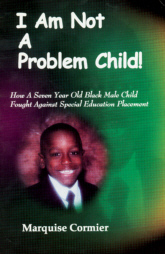 At the beginning of second grade, standardized tests showed that Marquise was gifted. Marquise and his loving, wise granny refused to accept the special education label. Marquise now makes the most of his gifts as a successful businessman, a motivational speaker, and a loving eight year old boy. This story is an inspiration for all, and a testament to the power of belief in yourself and family. "I Am Not A Problem Child!" is not to be missed! Copyright © 2003-2014 Professional Publishing House. All Rights Reserved. No Content May Be Used Without Expressed Written Permission.